Here is the list of the hotels near Reignier-Esery. Book your hotel near Reignier-Esery today, Wednesday 15 May for the best price, reservation and cancellation free of charge thanks to our partner Booking.com, leader in on-line hotels reservation. Below here is the list the 50 closest hotels of Reignier-Esery, sortable according your criteria. You will find the position of these accommodations on the Reignier-Esery hotels map. La Tour D'ivoire is located in Reignier in Haute-Savoie near Geneva. It offers affordable and spacious guestrooms for up to 4 guests. Both Wi-Fi internet access and private parking are free for guests of La Tour D'ivoire. The air-conditioned La Tour D’ivoire has a bar and a restaurant that serves traditional and regional cuisine. Affordable set menu options are available. The hotel also has a convenient 24-hour automatic check-in service. It can also provide taxi bookings to and from Geneva Airport. Guests who wish to have this service should contact the hotel in advance. In the immediate surroundings of the hotel guests will find the Medieval city of La Roche Sur Foron and the town of Annemasse. Offering free WiFi and mountain views, Villa near Geneva is an accommodation located in Esserts-Salève. This villa features a garden and barbecue facilities. The villa consists of 6 separate bedrooms, 1 bathroom with free toiletries and a hair dryer, and a seating area. The kitchen has a dishwasher and an oven, as well as coffee machine. The villa offers an outdoor pool. Villa near Geneva offers a terrace. Geneva is 11 km from the accommodation. Chambéry-Savoie Airport is 91 km away. La Sapotine is located 5 km south of Annemasse and 5 km from the centre of Geneva. It is an apartment with views of the surrounding mountains and is equipped with a washing machine. The apartment is made up of 1 large bedroom and 1 smaller bedroom, which both have a sloping roof. There is a flat-screen TV in the living room and an oven, stove and microwave in the kitchen. A breakfast is served every morning in the main house. The hosts can also prepare evening meals if you reserve in advance. Free Wi-Fi is provided in the entire apartment and free private parking is provided on site. The city of Annecy and its lake can be found just a 30-minute drive from La Sapotine. Hotel Bonne-sur-Ménoge Preferred hotel ! Hôtel Baud - Les Collectionneurs, is strategically located a 20-minute drive from Geneva on the road to Mont Blanc and Italy. It offers cosy, stylish and comfortable accommodation. Guests can enjoy the terrace with views over the river. The rooms and suites present spacious living areas and are all equipped with en suite facilities and modern amenities including flat-screen TVs and free WiFi access. Established over 100 years ago, the Hôtel Baud - Les Collectionneurs has been renovated over the past few years to keep offering guests an excellent standard of comfort and services. The restaurant serves refined, gastronomic dishes. Please note that reservation is strongly advised. Attentive staff will try their best to help you make the most of your stay and contribute to providing a comfortable home-from-home feeling. Featuring free access to a sauna and hot tub on the terrace, this renovated 20th-century farmhouse is set in the Haute Savoie region. The hotel features a shop selling wines and specialities from the South-West Region of France. A coffee machine, satellite TV and a minibar are standard in each air-conditioned guest room with contemporary decoration. Some rooms feature a private patio. All of the stylish rooms have panoramic views over the mountains. Specialities including cuisine from the Basque Country are served in the restaurant, which has a fireplace. A continental breakfast is prepared daily at L'Auberge De Maison Rouge and can be served in the room or as a buffet. The hotel also provides a fitness room and free Wi-Fi access upon request. Geneva is 5 km from L'Auberge De Maison Rouge and on-site private parking is free. Annemasse Train Station is 2 km away. Situated in Vétraz-Monthoux in the Rhône-Alps region, Appart aux portes de Geneve has a balcony and mountain views. This apartment also features free WiFi. The apartment is equipped with 1 bedroom, a fully equipped kitchen with a dishwasher, and 1 bathroom with a shower. A flat-screen TV with cable channels is offered. Geneva is 9 km from the apartment. 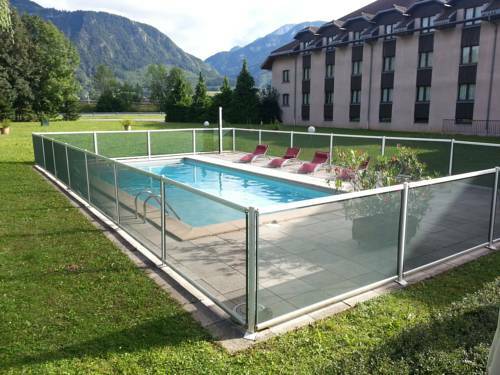 The nearest airport is Chambéry-Savoie Airport, 85 km from the property. Located 1.5 km from the entrance to Geneva, Hotel The Originals Porte de Genève Annemasse Sud (ex Inter-Hotel) features mountain-style rooms with free WiFi internet access, a restaurant and a fitness centre. Free private parking is available on site. With a traditional décor, each air-conditioned room at Hotel The Originals Porte de Genève Annemasse Sud (ex Inter-Hotel) has a private bathroom, tea and coffee facilities and a flat-screen TV. Interconnecting rooms for families and groups of friends are available. A breakfast buffet is served daily. Au Fil des Saisons, the hotel’s restaurant, offers Savoyard specialties and a daily menu, which can be taken in the dining area or on the shady, flowered terrace at the foot of Mont Salève. Surrounded by an 11-hectare park near the Arve River, Hotel The Originals Porte de Genève Annemasse Sud (ex Inter-Hotel) sits at the highway junction of the A40 and A41. Geneva International Airport is 12 km away and Geneva city centre is 8 km away. Ibis budget Annemasse offers accommodation just 3 km from Annemasse Train Station and 5 km from Annemasse Casino. There is free WiFi, a 24-hour front desk and gift shop at the property. Every room includes a flat-screen TV with cable channels. Each also has a private bathroom fitted with a shower. In the morning, a buffet breakfast is served. There is also a vending machine on site. The medieval village of Yvoire is located 25 km and Geneve city center is 10 km away. Vital Water Parc is located 20 km away, in Saint Julien en Genevois. There is free public parking on site. Mercure Annemasse Porte De Genève is a 15 minute drive from Geneva. It is located between lakes and mountains and offers comfortable accommodation and free parking. Guest rooms are air conditioned and have satellite TV and Wi-Fi access. At the Mercure Annemasse breakfast is served daily and the restaurant offers traditional and local cuisine. Guests can enjoy a meal on the terrace which is next to the outdoor swimming pool. The hotel is close to Geneva’s famous attractions such as the Saint-Pierre Cathedral and the Palais des Nations. Just 14 km away are the Palexpo and the Geneve Cointrin International Airport. At the crossroads of motorways A40 and A411, the hotel offers an ideal location to experience the area or to enjoy a restful stay. Only 10 minutes away from Geneva and close to the Swiss frontier, the hotel features 74 rooms that provide genuine comfort in order to make your stay as pleasant as possible. Comfort Annemasse Genève is situated in Annemasse, 2km from the train station and 8 km from Geneva. It offers free Wi-Fi internet access and free on-site parking. All of the en suite rooms at this Comfort hotel are air-conditioned and have satellite TV and tea and coffee facilities. Breakfast is available daily in the breakfast room at an extra charge. Guest can enjoy the free daily newspapers. Comfort Annemasse Genève offers affordable accommodation for overnight or short stays in the area. 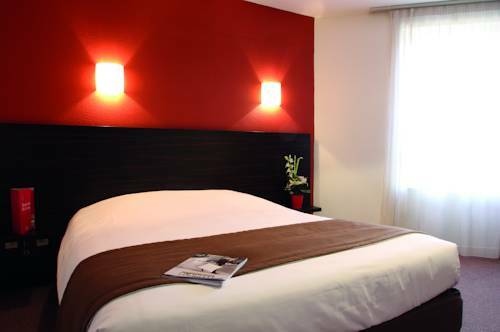 Located in central Annemasse, this hotel offers chic and contemporary rooms with flat-screen TV and parquet flooring. It makes the ideal base for a relaxing break or a business trip. Sure Hotel by Best Western Annemasse is well served by public transport. It is 5 minutes from the train station and 2 bus lines stop just at the foot of the hotel. Free parking is provided at the Sure Hotel by Best Western Annemasse, making it easy to explore the surrounding area by car. The hotel is situated within easy reach of Geneva Airport, Italy and Mont Blanc. Hotel le Foron is located a short walk from the city centre of La Roche-Sur-Foron, opposite the Exhibition Centre. It offers air-conditioned rooms with cable TV. Hotel le Foron also has an outdoor swimming pool and a relaxing garden. Meals can be enjoyed at a partner restaurant nearby the hotel. The hotel is just 20 kilometres from Geneva and Annemasse. In the surrounding area you can enjoy plenty of activities such as hiking, golf and skiing. Guest accommodation Annemasse Preferred hotel ! Appart'City Annemasse Centre features self-catering accommodation in Chablais eco-friendly district, just 10 km from Lake Geneva. Restaurants and shops can be found just 500 metres away. Place des Marchés is 300 metres away. The one-bedroom apartment and the studios come with a living room with flat-screen TV and a bathroom with a shower. There is also a fully equipped kitchenette with stove and microwave. Free Wired internet and WiFi are provided in apartments, studios and rooms. From Monday to Sunday, guests can enjoy a breakfast buffet in the breakfast room and reception area. Breakfast is composed of various breads, including gluten-free bread, pastries, fresh and hot beverages. Fresh fruit and fruit salad, as well as cheeses and yogurts are also provided. Guests can drive 30 minutes to Annecy or 40 minutes to Thonon-les-Bains. Annemasse Train Station is located 200 metres away. Geneva International Airport is a 30-minute drive away. Hotel Ambilly Preferred hotel ! Ibis Styles Annemasse Genève is situated just 7 km from Geneva and its lake and features contemporary rooms and modern comfort. A free buffet breakfast is served each morning. Guest rooms are equipped with modern en suite facilities and offer free WiFi internet access. Family rooms are available and can accommodate up to 4 guests as well as rooms for people with reduced mobility. Upon arrival kids receive a special gift and are invited to the main hall to play video games or use one of the 3 lobby computers. The location of the ibis Styles Annemasse Genève, with easy access to the lake and natural surroundings, provides you with a variety of outdoor and water activities. The hotel is just a short walk from Annemasse town centre and 10 minutes from the Archamps Technopole. Secured parking is available for an additional charge and subject to availability. Featuring free WiFi throughout the property, ibis Annemasse offers air-conditioned accommodation in Ambilly, only a 23-minute drive from Geneva and Léman lake. Guests can enjoy a drink in the on-site bar. All rooms include a TV. Every room comes with a private bathroom equipped with a bath or shower. For your comfort, you will find free toiletries and a hairdryer. A buffet breakfast composed of sweet and savoury dishes such as eggs, fruit salad, yogurts and juices is served every day. Pastries baked on site and fresh French Madeleine cakes are also on offer, as well as a hot beverage and a piece of fruit to take away. Outside of regular breakfast hours guests can also enjoy a lighter option, available from 04:00. You will find a 24-hour front desk at the property. The World Trade Centre is 17.5 km away. Annecy is 45 km from ibis Annemasse and the Italian border is 85 km away. The nearest airport is Geneva Airport, 18.2 km from the property. Hotel Annemasse Preferred hotel ! Offering free WiFi throughout, Campanile Annemasse Centre - Gare is located in Annemasse, 10 km from Geneva. Many shops can be found within a 5-minute walk. Each room here will provide you with a flat-screen TV and air conditioning. Extras include a desk, and a tea or coffee maker. The private bathroom comes with a bath or shower and a toilet. At Campanile Annemasse you will find 2 meeting rooms, a 24-hour front desk and a bar. Guests can enjoy a breakfast served every morning. The hotel is 250 metres from Annemasse Train Station and is next to Chablais Shopping Centre. Geneva Airport is 25 km away. Paid public parking is available nearby the property, subject to availability. Located in Fillinges in the Rhône-Alps region, Gîte "Le Champ des pierres" features a terrace. The accommodation has free WiFi. The chalet features 3 bedrooms, a kitchen with an oven and a microwave, a washing machine and 1 bathroom with free toiletries. A flat-screen TV with cable channels and a Blu-ray player are available. Fishing and hiking can be enjoyed nearby. Geneva is 23 km from Gîte "Le Champ des pierres". The nearest airport is Chambéry-Savoie Airport, 87 km from the property. This hotel, located 13 km from the centre of Geneva, offers free Wi-Fi access and free private parking on site. Première Classe Annemasse Ville La Grand features air-conditioned rooms. Each has a TV with satellite channels. All rooms come with a desk area and a private bathroom with a shower and toilet. Bunk beds are available free of charge in some rooms for a third guest. A buffet breakfast is served each morning. Restaurants and grocery shops can be found withing a 10-minute drive from the hotel. Annemasse Train Station is 3 km from the hotel and access to the A40 Motorway is 5 km away. Geneva Airport and Cornavin train station are a 35-minute drive away. Mont-Blanc tunnel is 77 km from the property. Appart’City Genève – Gaillard is located 300 metres from the Swiss border in the village of Gaillard. All the suites at this Appart’City Genève – Gaillard are equipped with a cable TV, en suite bathroom and a kitchenette. Breakfast is composed of various breads, including gluten-free bread, pastries, fresh and hot beverages. Fresh fruit and fruit salad, as well as cheeses and yogurts are also provided. Appart’City Genève – Gaillard is in the heart of the Savoy region, between Geneva and the Mont Blanc and has easy access to Geneva's business centre, the Palexpo Convention Centre and local ski resorts. Le Mouton Doré is located in Bonne-sur-Ménoge. Each unit is equipped with a fully equipped kitchen with an oven, a seating area with a sofa, a flat-screen TV and a private bathroom with shower and free toiletries. A fridge and stovetop are also provided, as well as a coffee machine. The holiday home offers a barbecue. The property has a garden to relax in after a busy day, along with a ski-to-door access. Geneva is 24 km from Le Mouton Doré, while Annecy is 50 km from the property. Chambéry-Savoie Airport is 88 km away. Situated just 200 metres from the Swiss border, Le saleve is an apartment featuring free WiFi and a 6 m² balcony. Free private secure parking is available on site. The apartment features one bedroom, a bathroom with a shower, and a living room with a dining table, flat-screen TV with 150 channels and kitchenette equipped with an oven, kettle and microwave. A washing machine, iron and ironing board are also provided. Several shops and restaurants can be found within a 10-minute walk. The number 12 tram to the centre of Geneva is just 7 minutes' walk away. Annecy is 45 km away. La Clusaz and Grand-Bornand ski resorts are both 50 minutes' drive from Le saleve. Ace Hotel Annemasse Genève is set in Ville-la-Grand. Featuring a 24-hour front desk, this property also provides guests with a terrace. Free WiFi is available. All units in the hotel are fitted with a flat-screen TV. The private bathroom is equipped with a shower. The units include a wardrobe. Geneva is 12 km from Ace Hotel Annemasse Genève, while Annecy is 49 km from the property. The nearest airport is Geneva Airport, 20 km from the property. Set in a renovated farmhouse, Le Bonheur dans le Pré is 15 km from Annemasse and 22 km from Les Brasses Ski Resort. The property features a terrace and free WiFi. 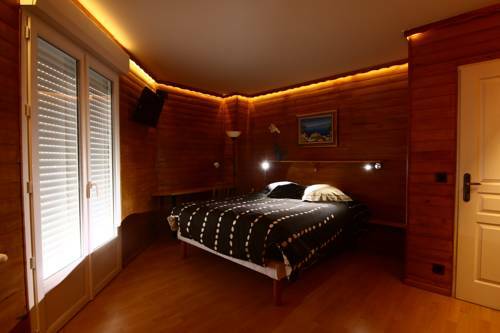 The stylish guest rooms are decorated in a chalet style with wooden furniture. Each room has garden and mountain views. Free toiletries are supplied in the private bathrooms. Seasonal produce, organic wine and products from the local market are prepared for dinner in the restaurant. Special diet menus are available upon request. A children's playground and a vegetable patch are available on site. Lake Geneva is 30 km from this hotel and free private parking is possible on site. Popular activities in the area include hiking and skiing. Located at the heart of the medieval city La Roche-sur-Foron, this non-smoking hotel is 40 minutes by train from Geneva. La Clusaz and Le Grand Bornand ski resorts are 30 km away. Each guest room is equipped with Wi-Fi access, a telephone and cable TV. All rooms have a private bathroom. The breakfast buffet at Les Afforêts includes local produce. There are 2 free public car parks located nearby and Lake Annecy is 34 km from the hotel. It is accessible via the A410 motorway. Located 2 km from the city centre, HotelF1 Annemasse offers accommodation in Saint-Cergues, 13 km from Annemasse. Free WIFI is offered in the public areas and a private indoor parking area is offered. Rooms come with a shared bathroom. Guests can purchase microfibre towels at the hotel at an extra cost of EUR 3 each. A buffet breakfast is served in the breakfast room every morning, at a surcharge. Le Grand Bornand ski resort is 43 km away from the property and the medieval city of Yvoire is is 9 km away. Geneva is 21.5 km from HotelF1 Annemasse, while Annecy is 52 km away. Entre Genève Annecy Evian 1 is situated in Saint-Cergues. Complimentary WiFi is available. The apartment includes 1 bedroom and a kitchen with an oven and a coffee machine. A TV is featured. Around the clock guidance is available at the reception, where staff speak English, Spanish, French and Portuguese. Geneva is 16 km from the apartment. The nearest airport is Chambéry-Savoie Airport, 91 km from Entre Genève Annecy Evian 1. Entre Annecy Geneve et Evian 2 is located in Saint-Cergues. Guests staying at this apartment have access to a fully equipped kitchen. The apartment includes 1 bedroom and a living room with a flat-screen TV. Languages spoken at the reception include English, Spanish, French and Portuguese. Geneva is 16 km from the apartment, while La Clusaz is 45 km away. The nearest airport is Chambéry-Savoie Airport, 91 km from Entre Annecy Geneve et Evian 2. Guest accommodation Saint-Cergues Preferred hotel ! Located in Saint-Cergues, Villa à deux pas de Genève is a chalet with a private heated pool. Évian-les-Bains is 34 from the property and Annecy is 51 km away. Geneve Train Station is 15 km away. Free WiFi is provided. This chalet features 3 bedrooms, 2 bathrooms and a living room. It also has a a fully equipped kitchen and a garden with a terrace. Many restaurants and shops can be found in the surroundings. Chamonix is 76 km from the property and La Clusaz is 44 km away. The nearest airport is Geneva Airport, 25 km away. Free private parking is available on site upon prior request. Situated between Geneva, Chamonix and Annecy, facing Mont Blanc, the Mont Blanc Hotel features modern accommodation. Located at junction 16 of the A40 Motorway, guests will appreciate the easy access to places like La Clusaz (25 kilometres), Le Grand Bornand and the Aravis and Geneva (30 kilometres). Guestrooms provide modern and functional living spaces. They are equipped with en suite facilities including a flat-screen TV with cable channels free WiFi and a private bathroom with a hairdryer. A hot and cold buffet breakfast is available for an additional charge. The hotel also features a traditional restaurant, a bar, conference and banqueting rooms. In the summer enjoy the outdoor terrace and the garden offering views of the surrounding mountains. This guest house is in the Haute-Savoie department, just a 35-minute drive from Geneva and a 16-minute drive from Annecy. It offers a landscaped garden and a large wooden terrace, furnished with deck chairs, with views over the mountains. L'Orée des Bornes’s rooms are individually decorated and are equipped with an en suite bathroom, free Wi-Fi, cable TV and underfloor heating. Some rooms have a view of the mountains or garden. A homemade breakfast is provided each morning. The guest house also has a living room with a balcony and a library. Guests have access to a fully equipped kitchen and can use the washing machine for an extra charge. Guests have access to the swimming pool in the park. There is also a BBQ and picnic tables in the park. L'Orée des Bornes is located just 2 km from the centre of Evires. Cabane L'Orée des Bornes is a detached holiday home set in Évires in the Rhône-Alps Region and is 20 km from Geneva. You can relax by the seasonal outdoor pool in the garden in fair weather. Free WiFi is provided . The chalet is equipped with a kitchenette. There is a shared bathroom with a shower. Annecy is 17 km from Cabane L'Orée des Bornes, while Megève is 37 km away. Free private parking is available on site. Situated 20 km from Geneva and 46 km from Chamonix-Mont-Blanc, Yourte du Margouillat offers accommodation in Saint-André-de-Boëge. The property is 39 km from Annecy and boasts views of the mountains. Free private parking is available on site. This yourte features a wood stove for the heating, a dining area and a kitchenette. There is access to an external bathroom and dry toilets. Other facilities at Yourte du Margouillat include a sauna and terrace. Megève is 41 km from Yourte du Margouillat, while Lausanne is 41 km from the property. The area is popular for skiing and horse riding. Featuring free bikes and a garden, Gîte Du Margouillat provides accommodation in Saint-André-de-Boëge with free WiFi and mountain views. The property has garden views. Boasting a DVD player, the holiday home has a kitchen with a dishwasher, a microwave and a toaster, a living room, a dining area, 1 bedroom, and 1 bathroom with a bath or shower. A flat-screen TV is provided. The holiday home offers a terrace. Geneva is 28 km from Gîte Du Margouillat. Chambéry-Savoie Airport is 92 km from the property. Located in Bonneville, Appartement Studio Comoretto au centre de Bonneville provides accommodation with a kitchen. Complimentary WiFi is provided. All units are equipped with a microwave, toaster, a coffee machine, a fridge and kettle. There is a fully equipped private bathroom with shower and a hair dryer. Geneva is 32 km from the apartment, while Annecy is 42 km from the property. Chambéry-Savoie Airport is 81 km away. Below here is the hotels map of Reignier-Esery. Names and details of Reignier-Esery hotels can be shown on the map clicking on the prices icons.